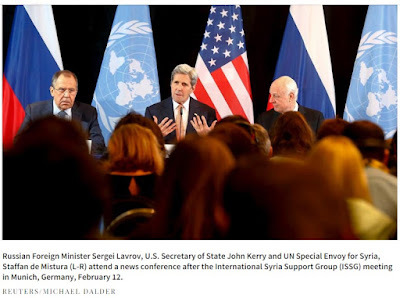 Syria: Cessation of hostilities - was John Kerry outplayed? One week ago, I wrote an article titled The U.S.-Russia brokered ceasefire in Syria - are we being naive? which I closed with this thought: "These [ceasefire monitoring] working groups generally become bureaucratic talk shops where nothing is resolved amid unceasing accusations and counterclaims, while the bloodshed continues. Russian and Syria aircraft will likely continue to attack the same groups they are fighting today under the guise of attacking ISIS." We are now just over three days into the Russian and American brokered ceasefire (technically a "cessation of hostilities") in Syria. While the two primary architects of the agreement - Russian Foreign Minister Sergei Lavrov and U.S. Secretary of State John Kerry - take a victory lap (see photo), Syrians continue to die at the hands of the Russian and Syrian armed forces. What many Syria observers, including me, suspected from the beginning of the ceasefire talks is in fact happening. The Russian and Syrian air forces continue their savage attacks on what they have labeled "terrorists." In reality, these are mostly so-called "moderate" anti-regime rebels, many of whom are being either overtly or covertly supported by the United States and some of its allies. In the minds of the Syrians, anyone taking up arms against the government is a terrorist. Not to be outdone, Russian media releases tout their attacks on ISIS, yet virtually all of the targets hit by the Russians are in areas far from known ISIS positions. These attacks have been conducted northwest of Aleppo, in the large rebel-held areas between Hamah and Homs, along the coastal mountain range east of the city of Latakia (in proximity to the air base used by the Russians), and even in the eastern suburbs of Damascus. The situation before and after the "cessation of hostilities" for the Syrian armed forces and the Russian Air Force pilots deployed to Humaymin Air Base remains the same - continue to attack anyone opposing the regime of Bashar al-Asad, in the name of fighting terrorists, a loophole in the negotiated ceasefire agreement. The only groups seemingly adhering to the agreement are the moderate rebels - if they dare launch an attack, it would simply draw even more brutal Russian and Syrian attacks, this time with reasonable justification. A cynic could surmise that the ceasefire is nothing more than open season on the rebels. This is not a surprise to people familiar with the situation in Syria or the players involved - it does seem to be a surprise for Secretary Kerry. While we all hope for an end to the bloodshed in Syria, this agreement will not accomplish that. Has John Kerry been outplayed by Sergey Lavrov? It will not have been the first time in this part of the world - I will forego other regions in which Kerry and Lavrov have negotiated. As I stated in my last article, Lavrov and Kerry have had at least three rounds of either direct or indirect negotiations concerning the Middle East. The results: the flawed Iranian nuclear agreement, the obviously failed Syrian chemical weapons agreement, and now a ceasefire that isn't. Even the French are outraged by the continuing Russian and Syrian air attacks. French Foreign Minister Jean-Marc Ayrault said, "We have received indications that attacks, including by air, have been continuing against zones controlled by the moderate opposition. France has therefore demanded that the task force charged with overseeing the cessation of hostilities meet without delay." The task force to which Ayrault is referring is the "International Syria Support Group" (ISSG), led by the United States and Russia, charged with monitoring compliance. That is diplo-speak for what I described earlier as a "bureaucratic talk shop where nothing is resolved amid unceasing accusations and counterclaims." I am afraid we have set up a long-term stalemate where hundreds of Syrians will continue to die while Russia and Syria diplomatically fend off accusations that they are violating the ceasefire - they will continue to strike any target they wish regardless of American and Western objections. They have done it before, and they will do it again. Well played, Messrs. Putin and Lavrov. The U.S.-Russia brokered ceasefire in Syria - are we being naive? The United States and Russia have announced an agreement for a ceasefire in Syria, scheduled to take effect on Saturday. U.S. Secretary of State John Kerry and Russian Foreign Minister Sergey Lavrov are calling the agreement a "cessation of hostilities" between the Syrian regime headed by President Bashar al-Asad and armed opposition groups seeking to overthrow him. However, not all parties are included in the cease-fire. Notably absent from participation in the agreement are the Islamic State in Iraq and Syria (ISIS), the al-Qa'idah affiliate in Syria known as Jabhat al-Nusrah (The Victory Front) and any militias designated as terrorist organizations by the United Nations Security Council. Given that these groups are involved in much of the violence in the country - ISIS killed over a hundred people in two Syrian cities under regime control just yesterday - it remains to be seen how effective such a limited ceasefire can be. The timing is suspect. By delaying implementation of this ceasefire until Saturday, the Syrian Army - backed by massive Russian airpower - will be able to seize more territory prior to the "cessation of hostilities." In the past few weeks, the Syrian military has gained momentum on the ground, particularly in the Aleppo area - by Saturday, they may be able to completely encircle the rebels in the city. I remain wary of any agreement brokered by Minister Lavrov and Secretary Kerry. Lavrov is a tough, skilled and experienced negotiator and no doubt has seized as much advantage as he can for the Russians. On the other side, we have an inexperienced John Kerry who seems to be unable to say no to any demands. Look at Kerry's abysmal performance in the negotiations (I hesitate to even use the word) over the nuclear agreement with his Iranian counterpart, Mohammad Javad Zarif. Virtually every "non-negotiable" point was negotiated, usually in favor of Tehran. As an aside, Lavrov was also involved in this agreement, convincing Kerry to allow Iran to trade in conventional weapons after five years and ballistic missiles after eight years. Secretary Kerry's record of dealing directly with Lavrov is no better. Remember the Lavrov-Kerry agreement on the removal and destruction of Syria's chemical weapons in 2013 after the Syrian Army used nerve gas against rebels in the suburbs of Damascus? Yet just two years later, Secretary Kerry again accused the Syrians of using chemical weapons - weapons the Syrians theoretically no longer possessed. Evidently, there was not an effective verification protocol and the Syrians retained a chemical weapons capability. It is expected that the U.S-led coalition and the Russian Air Force will continue to conduct air operations against Jabhat al-Nusrah and ISIS after the ceasefire takes effect. The problem is Russia's claims about what targets are ISIS and which are anti-regime opposition groups. Russian press releases claim airstrikes on ISIS targets in areas where there are no ISIS fighters. I have seen estimates that 80 to 90 percent of Russian targets claimed to be ISIS are in reality Syrian rebels. Who decides? Along that same line, is the Syrian Air Force also permitted to conduct strikes on "terrorist" groups? The Syrian regime considers anyone involved in fighting against it as terrorists, be they members of the Free Syrian Army, other armed opposition groups, or Jabhat al-Nusrah and ISIS. Again, who decides? These questions over who determines who is covered and not covered by the agreement are the reasons the parties will establish a "communications hotline" and a "working group" to monitor the ceasefire. 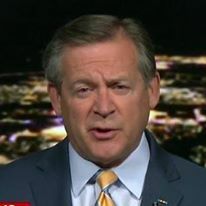 These working groups generally become bureaucratic talk shops where nothing is resolved amid unceasing accusations and counterclaims, while the bloodshed continues. Russian and Syria aircraft will likely continue to attack the same groups they are fighting today under the guise of attacking ISIS. I worry that we are codifying a stalemate and prolonging the suffering of the Syrian people. No sooner did I write this that the Syrian Arab Army Facebook page confirmed one of my concerns - they regard any of the anti-regime groups to be terrorists and thus excluded from the terms of the ceasefire. Not for the first time, the Islamic State in Iraq and Syria (ISIS) has been able to mount near simultaneous deadly attacks in two regime-held areas of two separate cities, killing scores of people loyal to the regime of Syrian President Bashar al-Asad. 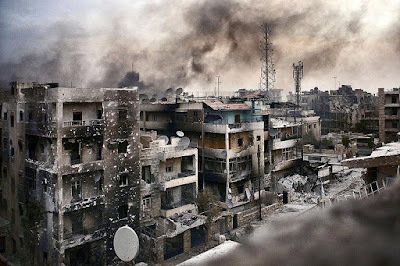 The attacks occurred in the city of Homs and a suburb of Damascus. In Homs, two car bombs detonated near bus stops in the al-Zahra' district - a pro-regime area inhabited mainly by members of the 'Alawi sect of Bashar al-Asad. 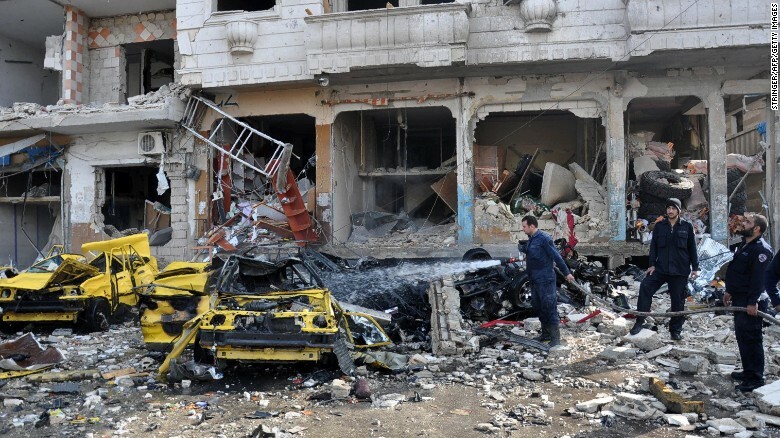 The twin car bombings are yet another in a series of ISIS attacks on the 'Alawi neighborhood - it demonstrates ISIS's capability to continue to strike regime targets inside regime-controlled territory. The selection of this target should not be lost on the Syrian government. 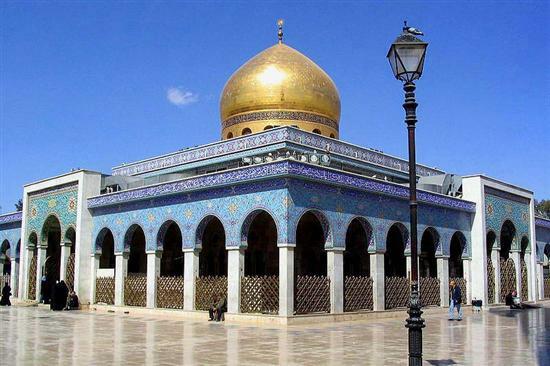 However, the deadlier of the two attacks - at least 83 dead - was in the Damascus suburb of Sayidat Zaynab, or the "Lady Zaynab" (in Syria more commonly called Sitt Zaynab). Three suicide bombers (one in a car) detonated bombs near the Sitt Zaynab shrine*, a holy site for Shi'a Muslims, particularly Iranian Shi'a Muslims. Lady Zaynab was the granddaughter of the Prophet Muhammad, the daughter of Imam ‘Ali (first Shi'a imam and fourth Sunni caliph) and the sister of Imam Husayn. She is revered among the Shi'a - her shrine is guarded by members of the Iranian Islamic Revolutionary Guard Corps. The timing of these attacks is suspect - coming at a time when US Secretary of State John Kerry says we are close to a ceasefire. His words: "We are closer to a ceasefire today than we have been...." Kerry said he and his Russian counterpart Foreign Minister Sergey Lavrov "continued to discuss the modalities" of the truce. That is all well and good, but when you are negotiating a ceasefire, all parties have to agree to stop shooting. ISIS is not a party to the ceasefire talks - nor should they be. You cannot negotiate with ISIS - you have to eradicate them. The actions today demonstrate that. 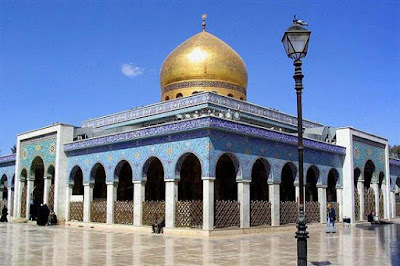 * I have been to the Sitt Zaynab shrine dozens of times - it is one of the most beautiful buildings in Damascus, both inside and out. It is a huge magnet for Iranian pilgrims and tourists. I hope that when all is said and done, this shrine survives. The inevitable fall of Aleppo - a turning point? It is only a matter of time. Aleppo, once Syria's largest city, will fall to the Syrian Army, reclaiming it from the Free Syrian Army (FSA) which has held it for almost four years. The Syrian Army is not capable of doing this alone - if they were, they would have done it long ago. It is only with the indiscriminate bombing by the Russian Air Force and support on the ground by Iranian Islamic Revolutionary Guard Corps (IRGC) Qods Force fighters that the Syrians are in a position to reclaim Aleppo. There are reports of Hizballah and Iraqi Shi'a militias working with the Iranians, as well as unconfirmed reports of Russian combat forces on the ground in the area. After years of ineffective operations and embarrassing setbacks at the hands of the FSA, Jabhat al-Nusrah (the al-Qa'idah affiliate in Syria), other rebel groups and occasionally the Islamic State in Iraq and Syria (ISIS), the Syrian Army has been able to make rather quick advances in Idlib and Aleppo provinces, as well as in the areas south of Damascus. However, it is the push towards Aleppo in Idlib province, southwest of the city, and in the mountains northeast of the port of Latakia that the Syrian Army has had the most success. Idlib province had almost completely been taken by the rebels in 2015, forcing the Syrian regime forces to withdraw to the south. Note also that the Russian Air Force is operating out of Humaymim Air Base just south of Latakia. What has changed in the last few months that has allowed the Syrians to be effective? Easy answer - Russian Air Force strikes and the increased deployment of Iranian fighters. Unlike the US-led coalition, the Russians do not exercise restraint when conducting air strikes - minimizing collateral damage (military-speak for civilian casualties) does not seem to be in the Russian lexicon. Hundreds, if not thousands, of Syrian civilians have been killed needlessly. 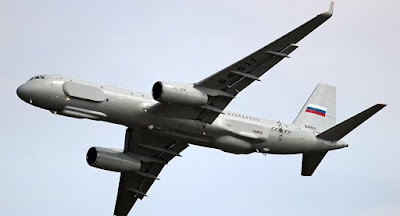 In addition to the Russian airpower and Iranian forces, the Syrians seem to be doing things in a more professional military manner - I have to assume the Russians are not only providing air support, but military advice and intelligence as well. The Russians have deployed their newest state-of-the-art TU-214R intelligence, surveillance and reconnaissance aircraft (photo) to the Syrian theater. As I said, I believe Aleppo will fall - given the recent change in Syrian Army momentum thanks to the Russians and Iranians, it is inconceivable to me that the rebels will be able to prevent the regime from gaining the upper hand. It does not help when the various rebel factions fight with each other rather than maintaining an alliance against the regime. The big question - what happens after the Syrian Army takes Aleppo? Here are my thoughts, what I suspect the Russians will advise the Syrian leadership to do. If I were the Russians, I would advise operations on two axes, indicated by the blue and black arrows. Ideally, these could be done simultaneously, but if that is too difficult for the regime and its Russian and Iranian backers, I would recommend they focus on the black arrow. This indicates an offensive to regain control of the main Damascus-Aleppo highway, often called the International Highway. It is an excellent four-lane, limited access route - crucial to consolidating control of the northern part of the country. It also splits the rebel-controlled area. Currently, the Syrian Army is using the route indicated in green as their main supply route from Hamah to Aleppo via Khanasir and al-Safirah. This indirect route uses a mediocre two-lane desert road that has areas of vulnerability to being cut by rebel attacks. The Syrians need to re-open the main highway to allow sufficient logistics to maintain control over Aleppo once the regime has taken it. 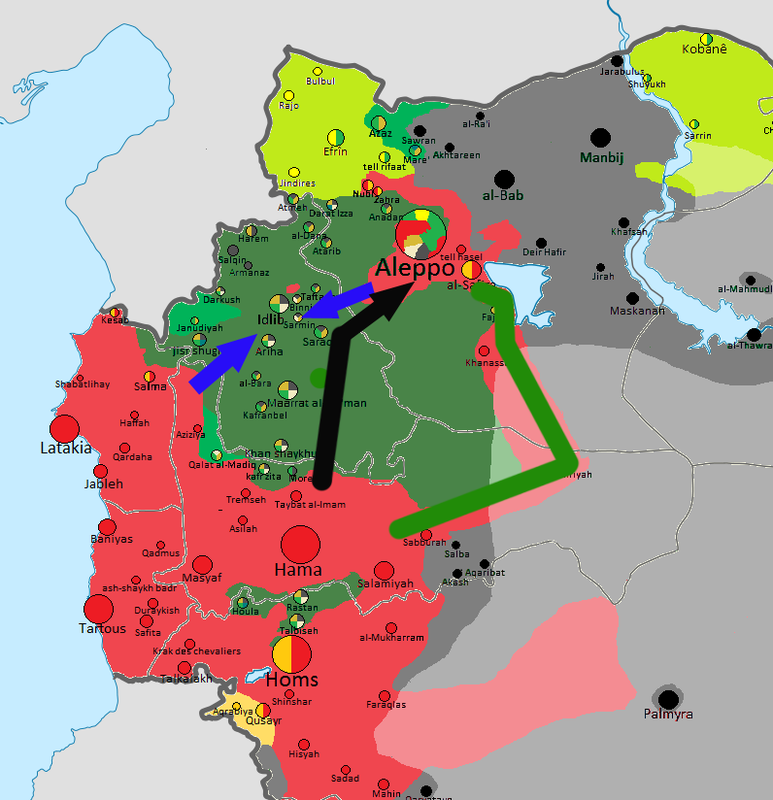 As for the axis indicated by the blue areas, this would re-open the Aleppo-Latakia highway, again splitting the rebel forces. The Syrian Army has been able to steadily push the rebels out of the mountains east of Latakia and edge closer to the Aleppo pocket. After the rebels have been split, the Syrian Army - with ample Russian air support - will likely be able to re-establish control over most of Idlib province. Unless the situation changes, the Syrians have an excellent chance of regaining control of a major portion of the north central part of the country. I have no reason to believe that the situation will change - in fact, given the penchant for the US Administration to make concessions to the Russians, there may be an increase in the tempo of Russian air operations and a resultant increase in Syrian Army efficiency. The tide of battle is shifting in favor of the Syrian regime of President Bashar al-Asad. The Russian and Iranian support has proven to be decisive. All that said, none of this changes the confusing situation involving the Turks, the Syrian Kurds and ISIS, not to mention the US-led coalition.